There have been a lot of rumors and discussion about the $99 Eachine EV100 FPV goggles recently. I already did some teardown, component analysis, component identification, analyzed the “diversity” feature of the receiver, and wrote about how to fix the gray bar problem in my previous posts. There is another problem with those goggles: No audio. Well at least no usable audio, you only get static noise. I do not know if this is only true for the first batch of these goggles or if this is not working for all versions. Mine was one of the first 1000 goggles that were sold and definitely had no working audio. The good news are that there is a fix. The bad news are that this is, again, no firmware upgrade. It will also require some delicate soldering. Have a closer look at the “invisible” parts that I labeled with C1, C2, C3, R1, R2, and 6.5M FILT. 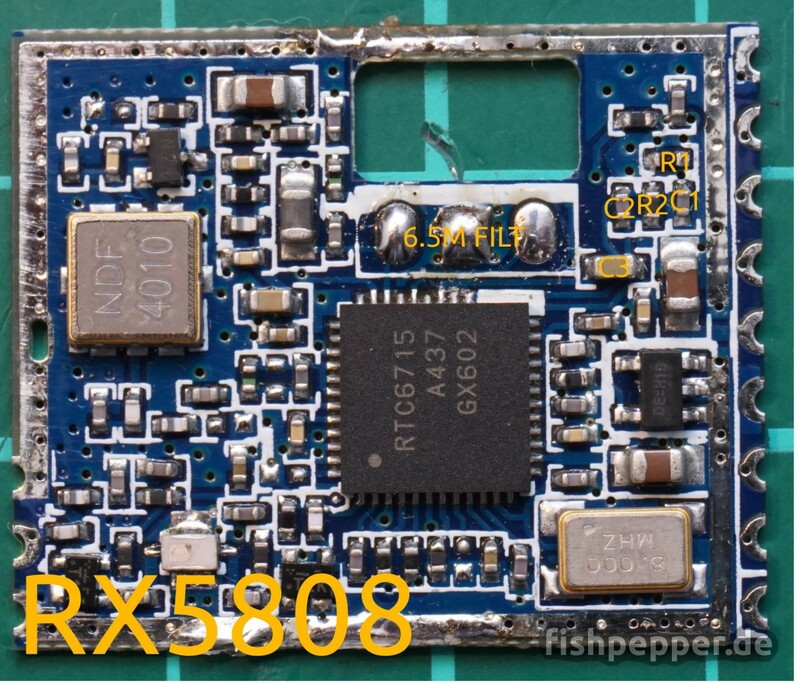 If you have used video receivers PCBs like the good old RX5808 in the past, you might have noticed that big blue blob with three pins on those. Every 5.8GHz video receiver module (hint: with working audio output) has this blob. 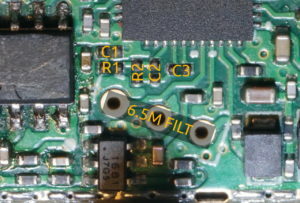 It’s a 6.5 MHz filter that is connected to the analog audio signal demodulation and conditioning part of the RTC6715 receiver chip. And you know what? 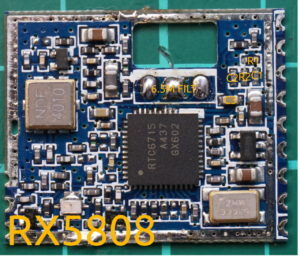 This is missing on the EV100 receiver module as Durete on rcgroups found out. 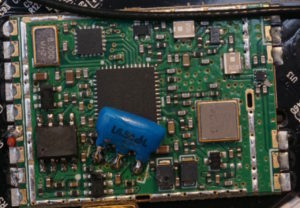 But at least for my batch of the goggle that’s not all, the other capacitors and resistors that are missing on my pcb also belong to the audio circuit: The audio leaves the RTC6715, then C2 and R2 do some filtering before R1 passes the audio to the audio output of the module. The capacitor C1 will do some more filtering. Most likely C3 will do some stabilization or some filtering as well. Eachine are you serious? 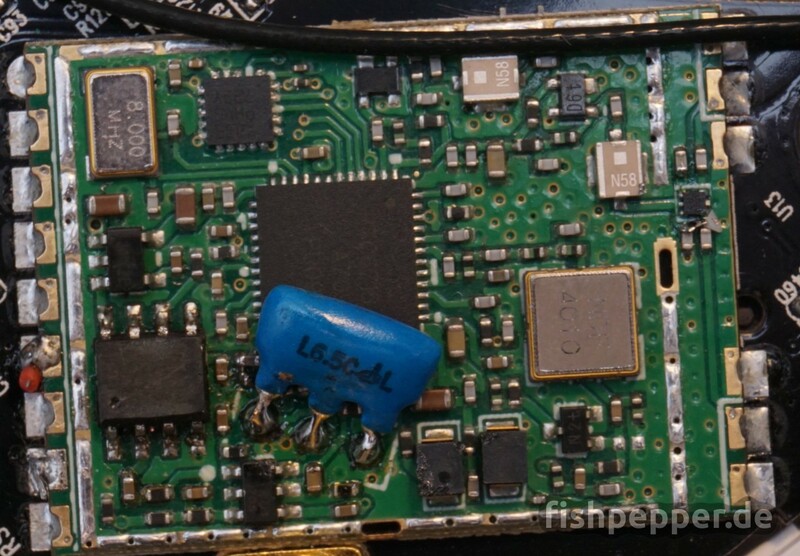 You sell goggles with an audio jack but use a module that does not have the audio part of the rx chip populated? For those parts where I could take measurements I listed the values in the following table. In case someone has access to a good LC meter and can measure the capacitor values please let me know the correct values so that I can add them to the table. UPDATE: I got hold on the application note and updated the table to show the correct values. As I had a spare RX5808 from banggood. I just used the components from that one as a transplant. I used my hot air gun to desolder and solder the parts to the EV100. Because the package of capacitor C3 is to big for the pads on the EV100 module I had to use some extension wire. 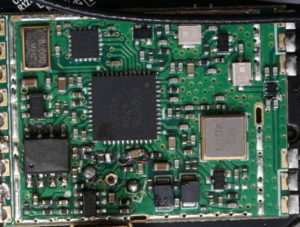 It looks like a mess, I did not want to desolder the receiver module and was scared to melt some plastic while using the hot air gun. As it turns out you can no longer close the EV100 plastic case with the 6.5 MHz filter installed. I think this will be a job for a dremel rotary tool in the future. UPDATE: Flycry on rcgroups found a nice and low profile SMD resonator that might do the job as well without the need to drill “speed holes” into the EV100 case. I did not test that yet, but it should work, just make sure to get the right frequency (TPSKA6M50B00-R3). 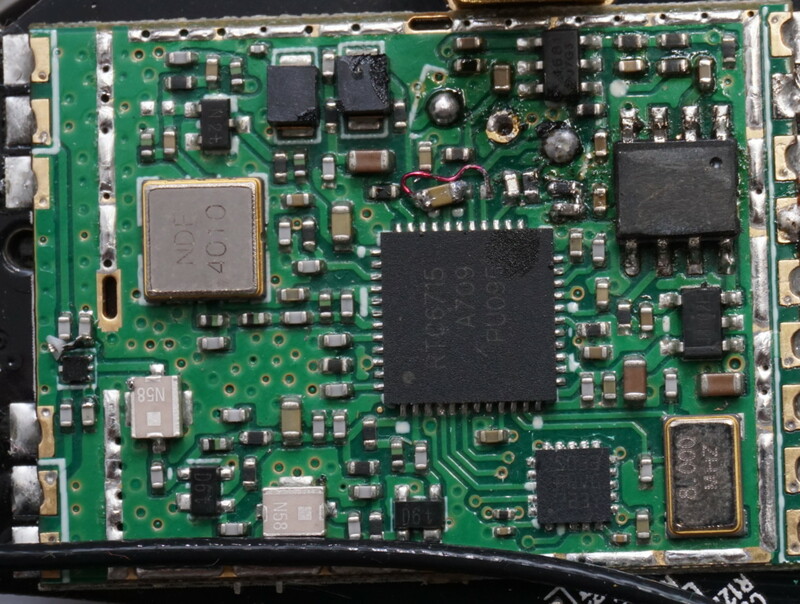 Now comes the moment of truth: Connect a battery, fire up your quad … and … tadaa… Working audio on the EV100! This is probably the first time a EV100 goggle had a working audio output — nice! Hi fishpepper and thanks for your works and sharing that! I have follow your instruction check all link connection continuty with multimeter and all seems ok, but when inser headphone I can’t hear nothing (also the white noise is gone). I don’t know which step follow to figure out where is the mistake. Do you have some suggestions? p.s. After the modification we have only to plug a stereo headphone to left jack (near usb female), isn’t it? Yes, the audio jack should be the one next to the USB port. Does your TX send audio? Maybe it is using the wrong carrier, could you check the filter on your transmitter if it is also 6.5M? Which TX do you use? I have test the same quad with another goggle with audio (Eachine Goggles Two) and work like a charm, so the trouble is my ev100 modded. It’s hard to see if the solder joints are all ok and not touching each other on some places. I also do not know if it is ok to extend the filter with cables. I heared of some people who did this sucessfully but I do not know if there is a limit. You could try soldering it in place. 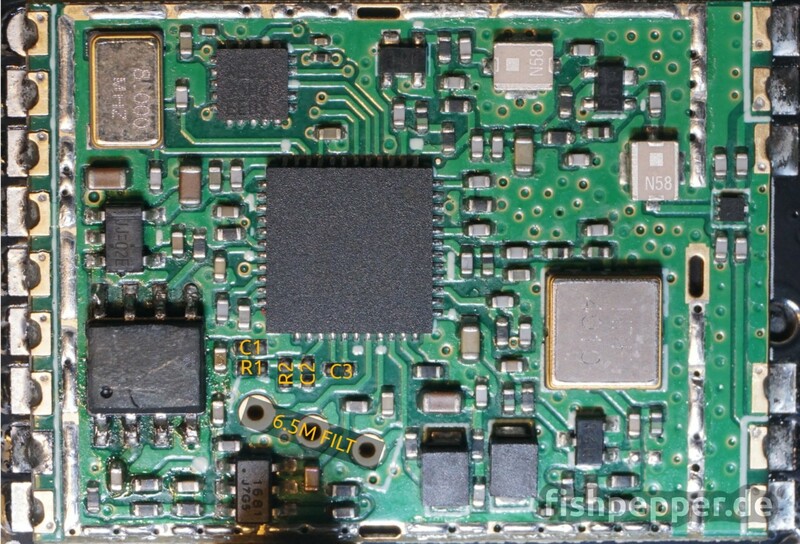 But isn’t there a real full diversity receiver module that would fit into that place ? Good article. It made me sure that NOT buying this crap was the best choice. Now i’m looking for these compones, but is no simple. If you have a good cell phone repair shop in your area they might help you. Some do fine pitched repair with a heat gun. hahaha. You are a man on a mission! Turning this utterly cripled goggle, into something that is acceptable. I will try to measure missing value capacitors next week using my LC Meter. Great article. I will have to open my EV100’s and make some mods.